Stony Brook Men’s Lacrosse needed one final offensive push to overcome the Bryant Bulldogs with 1:17 remaining in an 8-8 tie game. 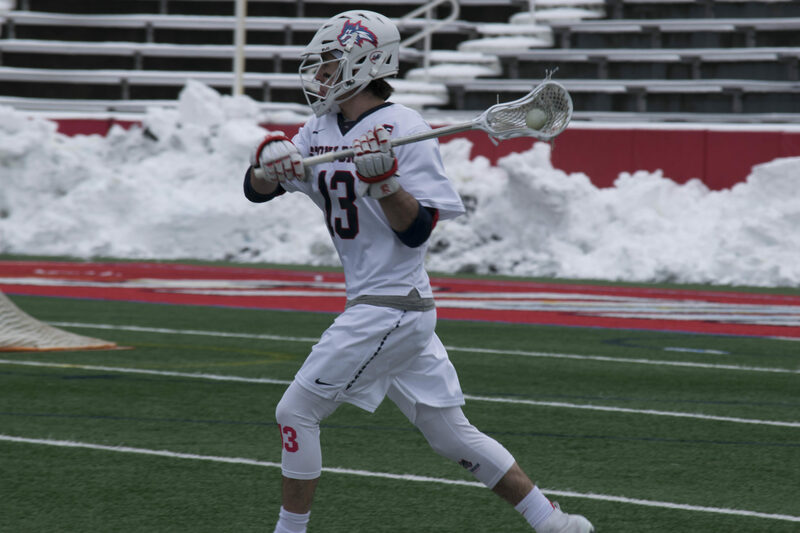 The Seawolves executed a calculated play which saw junior attacker Connor Grippe sneak inside the Bulldogs defense for the wide open scoring attempt. However, freshman goalkeeper Luke Caracciolo read the play perfectly and blocked the shot, keeping the score tied. Instead of bouncing out of play, the ball was scooped up by junior attacker Chris Pickel Jr.
Pickel Jr.’s blast connected with nothing but net and gave Stony Brook the go-ahead goal with 16 seconds remaining. The Seawolves held on to the victory for the first home win between either lacrosse program this season, and finish their ‘preseason’ with a .500 record. Stony Brook gained its largest lead of the afternoon, 8-5, in the third quarter, but Bryant chipped the deficit away off the goal by redshirt-freshman midfielder Nick Beeson with three seconds remaining. The Bulldogs benefited from compact defense with a clear that produced a goal by junior attacker Jameson Buttafuoco. Sophomore attacker Marc O’Rourke carried the momentum a minute later with a game-tying goal with 9:25 remaining. The battle in the net often favored the goalkeepers as Caracciolo and junior Michael Bollinger successfully put their bodies in the line of five. Caracciolo finished the afternoon with 16 saves, earning at least 15 in four of his first five collegiate games. Bollinger also gained a career-high 16 and concluded the contest with a season-high 67 percent save percentage. Both teams were statistically even on both sides of the ball. Offensively, each team finished with 24 shots on goal off 38 shots. However, the battle was dominated with calculated defense and clears near the net which kept the game in single digits and the largest lead at three. Pickel Jr. led the game with two goals alongside freshman midfielder Layton Harrell. The junior’s first goal cut Bryant’s lead down to 4-2, midway through the second quarter and sparked a four-point run capped by Harrell. The team turned to the freshman often offensively as he finished with a career-high seven shots. Stony Brook will begin a three-game series in America East action, starting out against the Hartford Hawks in West Hartford, Connecticut on Saturday, March 16 at 1 p.m.